Some Amazon businesses operate exclusively through Amazon. Other sellers start out offering products through their own website or by listing products on eBay and other online marketplaces. Still other sellers get their start selling products in their front yards or through local flea markets. Eventually, they all come together in the Amazon marketplace, and they share a continuous need for working capital. If you have the pleasure of working from home thanks to Amazon, you understand how difficult it is to find Amazon loans that fit your business model. You’ve likely had the unpleasant experience of watching quality inventory go to someone else because you simply didn’t have the cash to invest at the moment. If you want to take a risk on a new product that may or may not sell well, you have to buy the inventory first. When you find a great deal on inventory that you know will sell during a particular holiday season, you need the money to buy the products plus space for storage. When a product fails to sell, the cases stock up in your home or storage unit as constant reminders of your financial loss. Even worse, they may sit in Amazon’s warehouse, costing you money by the day. It doesn’t really matter how you got your start as an Amazon seller. What matters is that you solve your need for working capital without getting overwhelmed by debt or paying excessive finance charges. This guide will introduce you to your options, but even better, it will help you analyze the value of each option through the filter of an Amazon seller’s unique needs. You may start out simply buying inventory and putting it up on Amazon, but you will eventually have additional expenses. You may enhance your online marketing plan to drive consumer attention to your Amazon listings or business website. There’s a charge for that. Perhaps you’ll realize the convenience of shipping your inventory to Amazon warehouses through the Fulfillment by Amazon program. There’s a charge for that as well. An Amazon business grows and changes just like any other small business, but this type of business isn’t always treated the same by lenders. If you’ve ever tried to pitch your business to an angel investor or explain how you make money to a representative of your local bank, you’ve probably seen the blank stares of people who simply don’t understand how much money a passionate businessperson can make while working at home in their pajamas. More than a billion people around the world were shopping online in 2015, and experts predict that number will surpass 2 billion people by 2019. E-commerce is more common now than ever, but it’s still quite difficult for many online businesses to secure the funding that they need through the traditional lending channels. As an Amazon seller, you’re likely to find that you need options beyond your local bank. Is Now the Time for an Amazon Loan? Many online businesses start out with the reinvestment concept. They sell one round of inventory and then invest the profits into the next round of inventory. Consumer demand for their products naturally grows along with their branding and marketing strategies. If you started out this way as well, then you know that a problem eventually surfaces. You have high demand for a product that you can’t afford to stock. Perhaps you simply stop growing because you are continuously reinvesting the same amount of money, and that money is spent on the same products. If you want to take risks and keep up with the always-fluctuating consumer market, you need more working capital. Small business loans are an attractive option, but you have to question whether right now is the time to take on debt. If you haven’t created a business plan, right now is the time to put your objectives and goals on paper. Determine exactly what you will spend the money on and how much money you may need to reach your goals. You will also need a solid plan for paying the money back because you don’t want to cripple your future earnings by taking on too much debt too soon. You have enjoyed success as an Amazon seller, and you know that you can grow and earn more money if you invest more money in inventory. You have the opportunity to buy quality inventory that you are confident will sell well, but you don’t have the working capital to make it happen. You’re fully invested in your business and are ready to expand by trying new products. You’re a part-time Amazon seller interested in stepping it up so that you can work this business full-time. You have a detailed business plan or growth strategy, and you know how much money you need to take your business to the next level. There are many creative ways to finance a small business, but they aren’t all compatible with an online business. More importantly, they aren’t all suitable for sellers marketing goods through Amazon and similar online marketplaces. Let’s take a look at five small business financing options that you can probably rule out right away. Personal Loans: When you borrow money from friends and family members, you put your personal relationships on the line. You also open the door to criticism and interference as your friends and family members feel entitled to give their opinion on a business that they’re funding. Even if you have a wealthy loved one ready to hand over the cash, you may want to keep your business separate from your personal life. At least make sure that you have a clear repayment plan because you have a lot to lose if something goes wrong. Presales: You can generate funds by preselling products that you will release at a later date, but that only works if you have a product that consumers will line up to buy in advance. If they can buy your items at any time, they feel no urgency to secure their copy, or there are many other sellers with the same inventory, then presales simply won’t work. Angel Investors: Unless you have an innovative product that is disturbing an established industry or you put years into developing a technological product that the world has yet to experience, you aren’t likely to get the attention of an angel investor. Small businesses typically earn this type of funding when they have a big, unique idea that has the potential to explode into a massive business with a high profit potential. If you’re selling essential oils or t-shirts on Amazon, you aren’t likely to get an investment without a personal connection to the investor. Crowdfunding: It’s still possible to earn some money through crowdfunding websites, but most small business owners end up receiving only small donations from friends and family members. Unless you have a high-demand product or a business idea that appeals to the masses, you aren’t likely to generate a significant influx of working capital with a crowdfunding campaign. You also have to spend time promoting the campaign or no one will even know that it exists. Factoring: This strategy allows you to invoice your customers for money owed and then sell the invoices to a third party. The third party collects the money from your customers, keeps their share of the payment, and then sends you the remaining portion of the payment. The problem is that most Amazon businesses don’t operate through invoices. Their customers pay for their products through online purchases, eliminating the need to invoice and wait for payment. While factoring isn’t a factor for a strictly Amazon business, it is something to consider if you have another arm to your business where invoices are more relevant. You’ve now explored five options for small business funding, and you have a good idea why those options won’t work for most Amazon sellers. 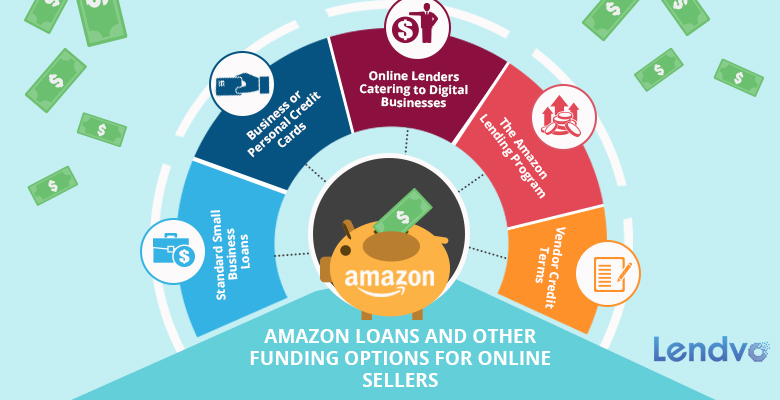 It’s time to learn about five Amazon loan options that will work for many online entrepreneurs, including sellers limiting their business to the Amazon marketplace. Visit your local bank or credit union. Small banks and credit unions are more likely to listen to your business model and give you a fair chance, but you will need a credit score over 700 for most banks to even consider extending a loan or line of credit. Watch the interest rates because they aren’t always the lowest options. If you own a home, take out a home equity loan or line of credit. You will still need good credit for approval, but these loans are often easier to obtain than a small business loan. Just keep in mind that you’re putting your home on the line. Payday loans and other short-term options are easy to obtain and you can have money in your account in just days, or sometimes even hours. The problem is that the interest rates are high and you have to pay the full amount back with interest in less than a month. Most payday lenders will only loan small amounts, and you may have to put up your car or other assets as collateral. It’s difficult to secure small business loans and lines of credit, especially if you don’t have stellar credit. Some lenders may not want to work with an online business selling through Amazon, and others simply have high standards that make it difficult for most small businesses to qualify. Thankfully, you have four other options to finance your business needs. Many businesses are funded at least partially with credit cards. If you have good credit, then you may qualify for high credit limits, and many credit cards now include rewards programs that can make financing your business even easier. Try to secure cards with 0% introductory rates so that you can fund your business without interest for a year or longer, but pay attention to the interest rate that will kick in after the introductory period. If you can pay your cards off by the end of your monthly billing cycle, you can limit the amount of money wasted on interest charges. You may also notice that high credit card limits pull your business and personal credit scores down, so try to keep your overall credit utilization lower than 30 percent if you want to eventually secure a loan through a bank, buy a home or use your credit for other large purchases. Many suppliers will offer special credit terms that allow you to take merchandise now while paying in full within 30, 60 or 90 days. Some of these agreements will also offer small discounts if you pay in full within a shorter period of time. Not all suppliers will offer these agreements, and you’re more likely to qualify if you’re an established seller. It also doesn’t hurt to work with a supplier over a long period of time to establish trust before you ask about the option for vendor credit terms. It’s only available for active Amazon sellers. You can’t apply for a loan. Amazon representatives have access to tons of data about your activity within the marketplace, and they use that information to determine which sellers receive a loan offer. You never know if you will receive an offer or when it will come. The terms of each offered loan vary. Amazon decides how much you are offered, how long you have to repay the loan and what interest rate you must pay. Your only option is to accept or reject the offer, so you have no control over the terms. Most loans are short term, so you will have to repay in full in six months or less. Since you can’t change the amount of the loan, you could easily accept more money than you really need. One option is to repay the unneeded portion of the loan immediately, limiting the amount of money that you have to repay by the end of the agreement. You’re only authorized to use the funds for legitimate Amazon business expenses, so it is more limiting than a standard small business loan. If you can’t repay the loan, Amazon reserves the right to take control of your business. They will claim money earned from your sales, and they can even auction off inventory stored in their warehouses until your loan is fulfilled. It is scary to think about putting your business on the line by accepting one of these Amazon loans, but there are some benefits that make it worth the risk for many sellers. For starters, the interest rates are sometimes lower than what you would pay through a local bank or by utilizing credit cards. The money is also instantly added to your Amazon account, so it is faster than going to the bank or applying for a credit card once the offer is actually extended. The lending industry is starting to make room for online businesses, so don’t lose hope if your local bank won’t extend even a small line of credit and you don’t want to exist solely on credit cards. There are a number of online lenders coming into the market, and they’re interested in working with online businesses. They understand your business model, and they’re not going to give you that blank stare when you say that you make money by selling products on Amazon. Lendvo is one of the leading lenders for digital businesses, but our services also extend beyond financing. Our goal is to help you grow your business, and we understand that may mean extending loans when needed. Decisions are made fast, so you don’t have to worry about your inventory selling to someone else while you wait for acceptance. Repayment terms can extend beyond 12 months, so you aren’t always locked into a short-term loan. You can borrow up to $100,000, and amounts as low as $5,000 are often acceptable. This is perfect for the beginning Amazon seller as well as top sellers interested in purchasing more expensive inventory. You’re never forced to accept an arbitrary amount offered by someone who doesn’t even understand your business model. You have control over what you borrow, and the terms are often customized to fit your needs. You can also apply for these loans online, and you don’t have to put your house or car up as collateral. Though the interest rates may go a bit higher than you would receive from some small local banks or credit unions, they are far more accessible for Amazon sellers and other online merchants. What do I want to accomplish with this loan? Is money what I really need to accomplish this goal? How much money do I need to succeed? How do I plan to pay the money back? Can I find a funding source that fits my goal and my pay-back plan? Go back through all of the small business funding options listed in this guide to answer that last question. More than likely, you will find at least a couple ways to fund your current goal. Now that you’re armed with a clear plan, you can make wise financial decisions that strengthen your Amazon business.